The acreage count at the Red Table fire has held at 20 acres with spotting still occurring within close proximity to the main fire. 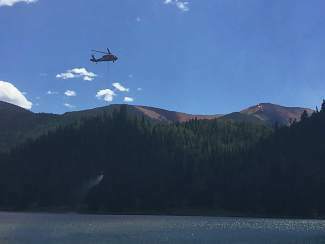 Aerial response began at 8 a.m. Thursday and the afternoon spike in activity prompted the use of helicopters dousing hot spots identified by ground forces. EAGLE — An aggressive response at the Red Table Fire near Sylvan Lake brought crews close to flanking the blaze by Thursday afternoon. 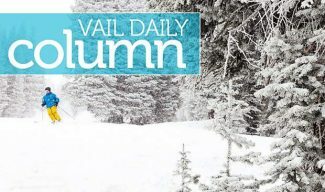 According to Kate Jerman, acting public affairs officer for the White River National Forest, multiple hand crews made progress while engaging the fire on Thursday. By late afternoon, crews were close to flanking the fire on the on the left, south-facing side and were putting in a line on the right flank of the fire. “There was a small and expected increase in fire activity during the afternoon because we had some sporadic breeze and it was hot,” said Jerman. The acreage count at the Red Table Fire has held at 20 acres, with spotting still occurring within close proximity to the main fire. Aerial response began at 8 a.m. Thursday, and the afternoon spike in activity prompted the use of helicopters dousing hot spots identified by ground forces. Jerman noted that a key factor in Thursday’s progress was partnership and teamwork. The crews continue to be focused on suppression and stopping fire spread to the north toward Sylvan Lake and protection of the transmission line adjacent to the fire. Jerman said there is not yet an estimate regarding a containment percentage at the site, nor is there information about what caused the fire. The fire is located 12 miles south of Eagle. The road going into the fire camp and staging area continues to be closed to the public except for overnight campers utilizing the campground. Conditions may change suddenly and anyone visiting the park is urged to call the park to check for updates. Areas near the lake at Sylvan Lake State Park are closed to day-use, due to Red Table Fire. For more information, call 970-328-2021.